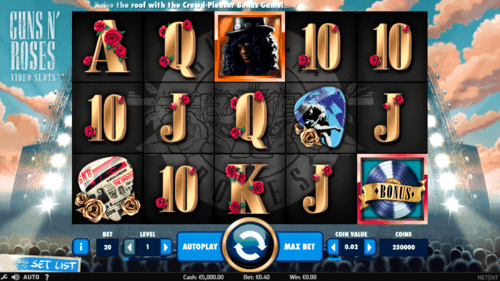 Guns N' Roses Video Slots is a 5 reel, 20 payline slot game with a 96.98% RTP and comes with Free Spins feature. Since the game is about music, it is properly themed to featured band members album covers, regular cards that are featured in most online slots game and music videos. The overall design of the game is eye-catching and amazing. In fact, you will feel really immersed in the world of a rock star while landing winning combinations of different payout rates. Guns N’ Roses is a production of Net Entertainment, in conjunction with Bravado International Group. The features of the game include 5 epic hits from which players can select from, good soundtrack, expanding wilds, a bonus wheel, encore free spins, destructive wild, solo multiplier, legend spins, and more. The company has produced many other games including Steam Tower slot and Aloha online slot among many others. It is obvious that Guns N’ Roses has received the bands blessing with all the logo and band present in the game. More so, the hit tracks of the original G’N’R band are all featured in the game – they are encompassed in the sound track. A fan of band music will not have a rethink before he decides to play Guns N’ Roses, especially reflecting on the fact that there are so may slot games that offer one the opportunity to listen to his favourite rock stars sing while spinning the reels for wins. Fans of rock bands are invited to play this amazing game irrespective of their budgets with a wide range of bet and coin amounts. Before the game can be started, that is, before you can start spinning, you’ll have to determine how mush you are willing to stake per play. The first thing to consider should be your coin value, which ranges from 1p through £1. You can select your coin value with the arrow buttons on the 2 sides of the coin value buttons located at the bottom of your playing screen. By default, all the 20 paylines are fixed, so you do not have to select the ones to be activated. To win you will have to land 3 or more symbols of the same kind across the active paylines from left to right. The magnitude of your winnings will be determined by how many symbols are present in your winning combination. Axl Rose is the most prized symbol in the game. Loading 5 of the Axl Rose symbol will award you 750 coins. The wild symbol in the game is the band logo. The wild symbol can substitute for other symbols aside the bonus symbols to make a winning combination. Some of the features of the game include Izzy Stradlin, Duff McKagan, Axl Rose, Slash and Steven Adler. You also have cards common in many casino games present; there are cards labelled Ace (A), K, Q and 10. All these are present in the game and are ready to journey along with you to win amazing prizes. Spin 3 will award you stacked wilds on reels 2 and 5. Destructive Wild: Destructive wild feature appears in the form of a cross and appears in 3 probable places at the centre of the reels. This destructive wild can replace other symbols, which could result in huge wins. Solo Multiplier: This is also a feature that occurs randomly after a win is achieved, of the symbols in the game will have a ribbon on it with a multiplier, and the multiplier ranges from 4x through 10x, which will be applied to your winnings, depending on the value appearing as the multiplier. Bonus Wheel: The bonus wheel features a number of free spins like the crowd pleaser, which will let you choose theme images to unveil coin amounts that could be won. You also have the encore free spins that will give you 10 free spins. In addition, there is the coin wins that will award you the value of the coin that appears on the bonus wheel.